At Carol Norman's Pro Shop you will find a full service, one stop shop that will propel your bowling game to the next level. Carol and co-owner Donna Conners offer a full line of bowling balls, shoes, bags and accessories. In addition you can receive world-class bowling instruction and clinics. Donna Conners and Carol Norman have both been listed on the Bowlers Journal Top 100 Coaches list indicating they are among the finest teachers of bowling in the world. 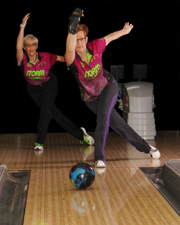 Both are part of the Storm Bowling staff and are Silver Level Certified Instructors. When they are not conducting clinics they are available for private lessons by appointment, year round. Carol's career in the bowling industry began as a member of the PWBA. In her 20 year career as a professional bowler she won 6 titles including a U.S. Open. Carol was the first woman to shoot back to back 300 games and has garnered 23 of them in total. In 2001 Carol was honored by the WIBC by being inducted into their Bowling Hall of Fame. She is also a member of the Oklahoma bowling hall of fame. Following her career as a professional bowler, Carol began working as a ball driller with Storm Bowling at the National Bowling Stadium and continued to work at the Storm booth at the USBC National tournament and is now an IBPSIA Certified Advanced ball driller. While at the National Bowling Stadium, Carol also worked for 3 years as a CATS instructor providing state of the art, computerized bowling instruction to bowlers of all ages and averages. Donna is an award winning bowler in her own right. She is a member of the Houston and Texas Bowling Halls of Fame. Donna has bowled 22 career 300 games and as a member of the PWBA's southwest region, she won 7 titles and was named their bowler of the year twice. When visiting Carol Norman's Pro Shop you will find the newest bowling products available on the market, and also state of the art technology in ball drilling and ball maintenance. The pro shop boasts a Storm resurfacing machine that allows you to restore the surface of your used ball back to new. You can also benefit from the use of their Rejuvenator, a machine which bakes the oil from a bowling ball that has been absorbed into the coverstock.